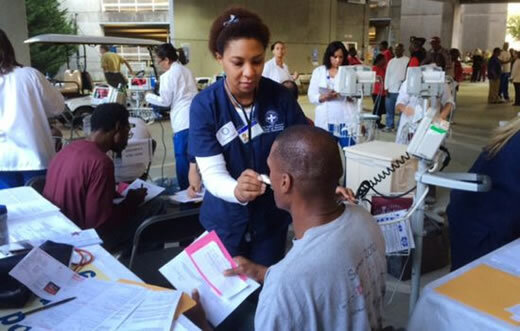 Emory nursing students volunteer in a free clinic serving Atlanta's homeless veteran population. The Nell Hodgson Woodruff School of Nursing at Emory University ranked 10th among nursing schools in the "America's Best Graduate Schools" guide released today by U.S. News and World Report. This top ranking is the highest in the nursing school's history, and was based on new statistical and reputational data introduced for the first time this year by U.S. News. The school has a long-standing history of educating women and men to be leaders at the forefront of the health care community. With bachelor's, master's and doctoral degrees along with specialized areas such as the nurse-midwifery, neonatal and women's health nurse practitioner programs, the school is recognized as a premier institution focused on health promotion, disease prevention, health maintenance, education and research. Now with specialized programs, partnerships, and unique training and mentoring opportunities, the school has grown to address the unique educational needs of its students and their diverse patient-care interests. "This year's U.S. News and World Report rankings validates the strength of our nursing programs and our commitment to developing outstanding nursing leaders," says Linda McCauley, PhD, RN, dean and professor of the Emory School of Nursing. "We are extremely proud to be counted among the top nursing programs in the United States."